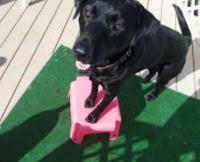 In a few simple steps you can teach your dog to step up onto an object. This trick can be used to get pictures of your dog posing, and it is also the foundation for other tricks. It helps to use a marker like a clicker or word to tell your dog exactly what they did to earn the reward. Once your dog is reliably stepping up onto the object, you can add a cue word like "step up", or "paws up". These steps will give you instructions on using luring to teach this trick, but you can free shape it too! 1. Find a sturdy step stool or box, one that won’t tip, and will hold your dogs weight. 2. Lure your dog onto the step with a treat and some encouragement. To lure your dog hold the treat directly in front of their nose allowing them to sniff at it, and than move your hand to guide your dog onto the step. 3. Reward your dog immediately for making contact with the step even if your dog is not fully on it yet. Keep asking for more until your dog can put both front feet up confidently. 4. Increase the length of time that your dog remains in the position before you reward. 5. Use a release cue to tell your dog to end the behavior like "free". (If you have not yet taught a release cue, you can work on this separately ). If your dog is unsure about stepping up onto an object, you can help them build their confidence by starting with a flat object like a mat and slowly raising it up. Remember every dog is different, and its important to work at a pace that is comfortable for your dog. Luring (having your dog follow a treat or target to move them into position) can be an effective tool in training, but you should always fade the lure quickly so your dog does not rely on it. Be sure that whatever object you ask your dog to step onto is safe and comfortable for them. Objects that are too slippery, to high, or wobbly can scare your dog and even result in injury.